Jen-Hsun Huang says the company's mobile chip will show 100-times improvement from the first generation to the fifth. The next generation, coming later this year, is code-named Logan, while the fifth generation of Tegra is code-named Parker, Huang said at the company's GPU developers' conference. 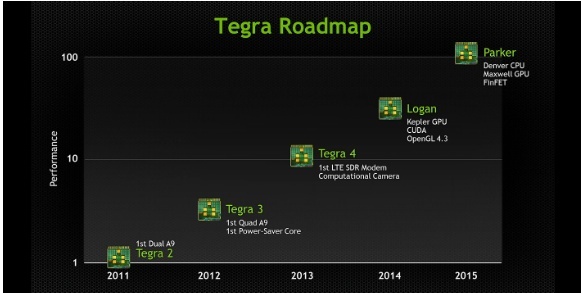 Logan will incorporate NVIDIA's Kepler GPU, which currently is dominating the discrete graphics market. It also will include CUDA, NVIDIA's programming model for GPUs that allows users to do many tasks at once. Parker, meanwhile, will be Nvidia's first processor from its Project Denver push. That includes full 64-bit capabilities, making it more attractive for use as the brains in one's computer or in a server or supercomputer. NVIDIA first started talking about Project Denver during the Consumer Electronics Show in 2011, but it hadn't provided many updates since that time. Parker also will incorporate a Maxwell GPU, NVIDIA's next-generation architecture. Meanwhile, Huang today also unveiled NVIDIA's next-generation GPUs. The Kepler architecture, which is currently shipping in devices, will be followed by Maxwell in 2014. That architecture has a unified virtual memory that makes it possible for GPU operations to read and see the CPU memory, and vice versa. All memory is visible to all processors. That's going to make it easier for developers, Huang said. Next comes Volta. That GPU will have a new technology called stacked memory. 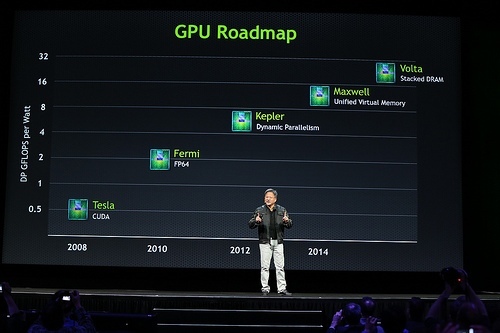 Nvidia said it will solve one of the biggest challenges today, which is memory bandwidth for GPU. Volta will take a leap forward and will stack the DRAM on the same silicon substrate. It will carry DRAMs stacked on top of one another.